Looking For A Luxurious Private Care Home in Herne Bay, Kent? Located in the picture postcard seaside town of Herne Bay, St Peters Care Home is the perfect place to spend your later years. With outstanding levels of care and tastefully decorated, spacious accommodation you’ll experience luxury private care at its very best. The home is an elegant Regency period building that has been completely renovated inside and out . Accommodation is available across four easily accessible floors, each with it’s own library, living room and kitchen offering a wealth of possibilities. For your own room you can choose a view overlooking the immaculately manicured and fragrant gardens or out across the wide open expanse of Herne Bay itself. Supported by our dedicated team of long serving staff you’ll quickly settle in. We operate a very high staff to resident ratio to ensure that there’s always someone on hand to help whatever you need. The home has a very homely and welcoming atmosphere so we think you’ll find genuine friendship and companionship both from staff and fellow residents alike. The best way to find out if St Peter’s is the right place for you is to come and visit. We’d be delighted to meet you and to show you around the facilities. You’re welcome anytime though it’s best to phone ahead to ensure the Home Manager is on site for a confidential chat about your requirements. P.S. 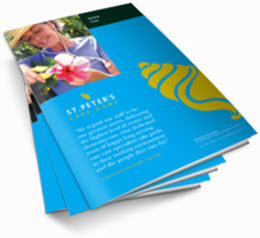 St Peters is a very popular home and we often have a waiting list for places. To avoid disappointment we recommend calling at your earliest convenience to arrange a visit or to secure your room.